UPDATE! 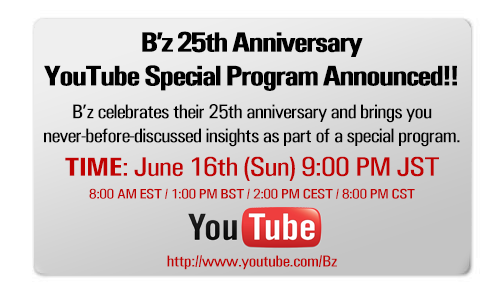 The special program has been scheduled for this Sunday, June 16th, at 9:00 PM JST (8:00 AM EST, 1:00 PM BST, 2:00 PM CEST, and 8:00 PM CST). You can watch on the band’s YouTube channel and expect full coverage from us here at OFF THE LOCK once the program is over! Let’s hope they pick that one. Let’s ask a lot of question in English!! I already asked five of them. I don’t how they’ll react if I post them several times? Will there be a report of this? Were there any questions concerning a European tour or something along those lines? Yes, it’s coming! And no, there weren’t any questions about a European tour or the likes. B’z has stated numerous times that they would like to play all over the world, if there’s a certain demand.